Do you have a stunning photo of a place in AmericaNorth, South or Central America? 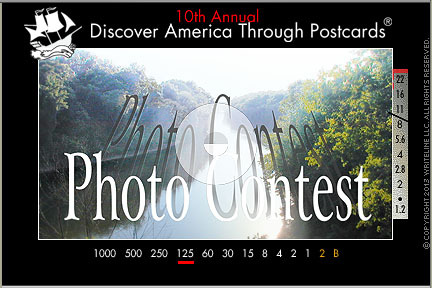 Well, dig it out and submit it to our annual Discover America through Postcards Photo Contest. The image should show enough beauty or curiosity to entice viewers to want to learn more about the place. Four finalists will be selected based on originality, composition and technical execution. 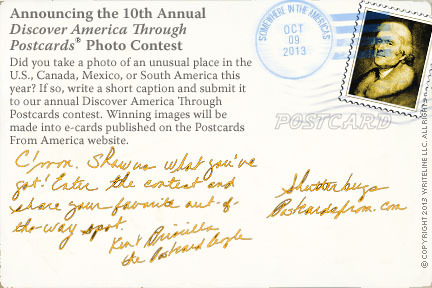 Each of the four images will be made into a postcard featured on the Postcards from America website. The winner of the $100 Grand prize will be announced on December 10, 2013. Entries will be accepted until 8 PM, EST, November 15, 2013. Enter today!